Me: Ok, so our numbers for the 4 week program are down, why don’t we start offering 1 or 2 week sessions as an option. Him: Yeah, we had already talked about that being a possibility, so I went ahead and told them they could do that. Me: Tell them they can pay x amount for one week, x amount for 2 weeks or the original x amount for the full 4 weeks. Him: Well I already told them they could pay x amount for 1 & 2 weeks. Me: Oh…why did you do that? Him: I just assumed that we would divide the original cost by 4 and charge them that, and since we had already talked about 1 or 2 week sessions being a possibility I just went ahead and told them that. Me: I wish you hadn’t done that. Typically if you’re offering a program with the option of smaller sessions, you charge different prices and offer a “discount” of sorts for the full sha-bang to encourage people to opt in for the full program. It’s like when you go to the store and there’s a deal on “Regular price $6.99 or 2 for $10.00”. Him: Well, I didn’t realize that, but it’s too late, I’ve already told them a price. Me: Yup, you’re right. We’ll just have to go with what you told them. He was annoyed, I was annoyed, so we just left it at that for a little while and carried on with the other items on our to do lists. He accepted my apology and we agreed to make sure we were being more clear in our communication moving forward, and trying not to make assumptions. Then we high-fived. This summer he approached me and said that he had been in a meeting with the head honchos from XYZ and they were interested in some partnership opportunities. He thought it was totally awesome, green lights all around, wanted me to take over and make it happen. So I thought to myself, man, this is sort of a bummer, I don’t really want to pay a bazillion dollars for this, it’s most likely going to come out of my budget and there are so many other things I could do with that money. But Big Boss man is excited about this relationship and said to make it happen, so that’s what I’ll do. We didn’t high-five but there were some very efficient and professional head nods exchanged. Then yesterday I thought to myself. Hey, wait a second… if I’ve learned anything this week, it’s to make sure I don’t make assumptions. I’d better follow-up with the people involved in this project that I’ve been tasked with. So based on that conversation, I went ahead and assumed that the crew from our other program had all the details and had already chatted about this and so on. But yesterday, I decided I’d just better make sure. I went out back, asked them if they knew about this and you guessed it… nope, nada, nothing. They said they were happy to do it, just like they did last year but they hadn’t been approached about it by anyone yet. Fortunately there’s still lots of time before the event, so it wasn’t a big deal at all. But it really could have been. Baton passer made an assumption that I could read between the lines and figure out that it had now become my responsibility to arrange the food part of the event. I made an assumption that it was already arranged based on the conversation I was part of. Unfortunately, there were no high fives in this situation either. I have got to teach the people in the office to be more “campy”. Here’s the thing about assumptions, they’re sneaky. 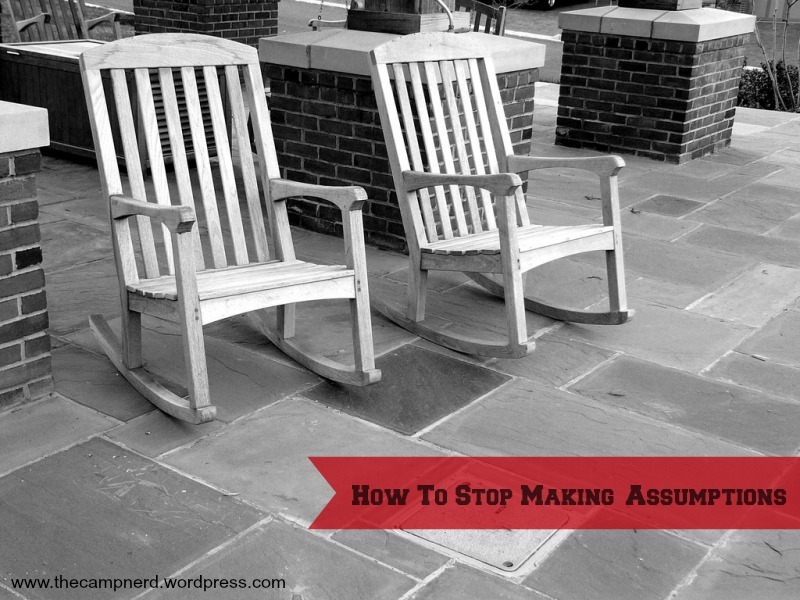 The worst part about making an assumption is that sometimes you don’t even realize you’re doing it! You just “know” it’s a given. You don’t think to question “why” you think the way you do, you just believe it to be true. If you can’t pinpoint an exact reference for that belief, and you’re just operating based on past experiences, or what makes sense to you, then it’s in your best interest to double-check. This is just another stop on my journey of becoming a more effective communicator. I am not typically someone who jumps to conclusions, but those little assumptions will sneak in from time to time, so I’m learning to be more thorough in my communication and hopefully that will prevent any more situations like the ones above. Have you had an experience where you made an assumption and it came back to bite you? Or some tips on how to avoid making assumptions in the first place? I’d love to hear from you, tell me about your experience in the comment section below.